Licensed at least three (3) years as a full cosmetologist. Hold an instructor license or have had educator experience. Must be available to teach on Sunday, Monday or Tuesday during the day and evenings. Willing to travel throughout Minnesota. Individual must be located within the seven county Metro area. Be a member of SSPA and/or willing to join. Please submit your application along with your resume, including area(s) of expertise, portfolio (optional) in .pdf format and a short video clip no more than 2 minutes long (optional) of you teaching a subject related to the industry. 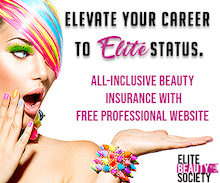 Licensed at least three (3) years as a cosmetologist, esthetician or nail technician in the State of Minnesota. Must be available to teach on Sunday, Monday or Tuesday. Willing to travel to Greater Minnesota and or to the Metro area. Please submit your application along with your resume, including area(s) of expertise, portfolio in .pdf format (optional) and a short video clip no more than 2 minutes long (optional) of you teaching a subject related to the industry. Professional Liability Insurance as low as $149 per year!